superpowers which sets us apart. At Ritualize we know how difficult it is to get busy people interested and then keep them hooked so they can do great things. Our quest based approach is the perfect technology based solution. Designed to deliver big achievements in little time, it’s highly flexible to fit into your organisational calendar and your employees’ day. Ritualize kept me focused on improvement more than perfection, which is much better for me. 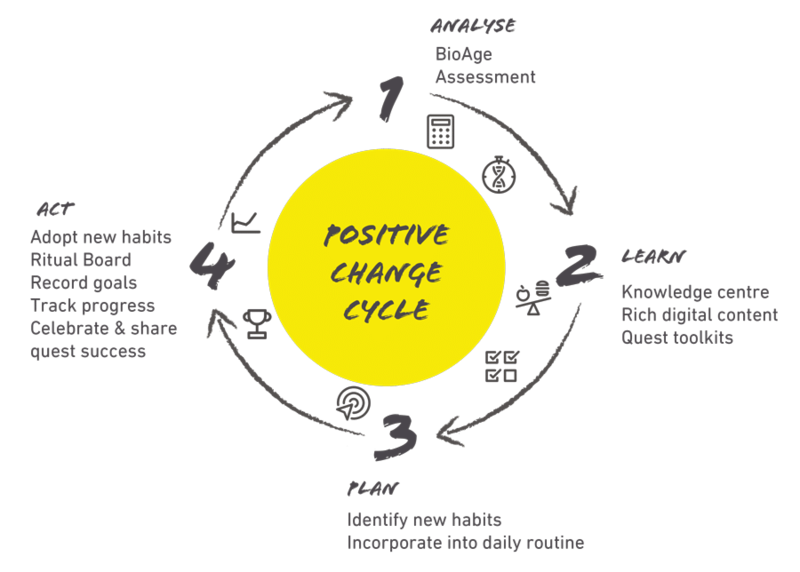 Our positive change cycle is a closed feedback learning loop which empowers individuals to take ownership of their own wellbeing and creates sustained behaviour change. Ultimately resulting in improved wellbeing and workplace performance. The Ritualize BioAge Assessment has received overwhelming support from participants and is used by a leading global health and fitness club to assess the starting health of their members around the world. BioAge measures health and wellbeing against actual age to work out an individual’s starting point and engage them in their performance wellbeing journey. Ritualize then shows them how to reduce their BioAge by adopting healthy rituals during the Quests. By doing this they’ll also gain points for their team to help them climb the leaderboard. Think of Ritualize as a mobile knowledge centre containing all the information and skills people need to get started and improve how they eat, move, sleep, think, interact and live. It’s full of the latest expert tips, recipes, workouts, life-hacks, mindfulness techniques and more. These are packaged in quest toolkits and include animations, infographics and videos to enable users, at all levels of the health and fitness spectrum, to define what living better means for them and to start to change. Ritualize helps employees identify the changes they are going to make and then create their personal plan for success. Employees tick off healthy rituals and track their progress on personalised Ritual Boards and are encouraged to track other behaviours relevant to each educational Quest. In this way, they’ll be adopting a series of healthy habits across a number of lifestyle areas. What we eat is essential for the health of our bodies and brains, but conflicting dietary advice leaves people confused and without results. The Ritualize 80/20 approach cuts through the noise and offers the tools and information you need to make small, sustainable changes to your eating patterns to fuel your way to better health. Ritualize enables your employees to identify opportunities for increased overall movement in everyday life, to improve how their bodies and brains function. We have also created a series of short workouts to maximize ROI in exercise and have some great life hacks to boost metabolism. Science tells us that sleep is critical for physical and mental health as well as cognitive performance and DNA repair, yet poor sleep patterns are on the increase. Ritualize provides employees with the tools and techniques to quieten busy minds and transform poor sleeping habits to achieve the amount of quality sleep the body and mind need to rest, repair and remain healthy. Loneliness is the single biggest contributing factor to poor wellbeing. We have a fundamental need to interact with others, in fact evidence shows that our personal happiness and wellbeing are influenced by our relationships and the happiness of those around us. Ritualize understands the scientific thinking behind this and gives you the tools and strategies you need to enhance your social wellbeing. The way we think has a huge impact on both our wellbeing and our performance, and this is especially true when faced with stress. Ritualize teaches your employees a range of techniques employed by the military and athletes to move beyond resilience to a state of stress adaptation. We work with corporate clients big and small to help drive your Health & Wellbeing Program. Whether you are an insurer or health provider (public or private) our off-the-shelf or white label solutions will enhance your product portfolio and drive better outcomes to wider audiences.